The Travellers Guide has an extensive choice of family friendly Jersey hotels and bed & breakfast accommodation. We have some great "early booking" hotel discounts, "free night" deals and "dinner bed and breakfast" offers so please view our Jersey hotel offers page. Jersey is situated just 14 miles from the coast of France and it is a very popular destination for family holidays. Jersey is the largest Channel Island and it has plenty of tourist attractions, organised year round events, safe sandy beaches and picturesque coastal walks to keep your family entertained. Our Jersey Tourist Information pages provide more information about popular Jersey tourist attractions and the Jersey events planned throughout the year. FlyBE, British Airways and Blue Islands are airlines who fly to Jersey, Channel Islands. View the Jersey golf courses page for more information. Hotel Miramar in St Brelade, Jersey, is a family-run country hotel overlooking the beautiful bay of St Brelade. Hotel Miramar is just one minute from the bus stop to St Aubin, St Helier and Corbiere. At Hotel Miramar there is a high standard of food and wines within a comfortable and pleasant environment. Marina Metro Hotel near St Helier has fantastic seaside views. It is located on the promenade in Havre des Pas, adjacent to the open air swimming pool/ Lido and next door to the Alix Shipyard Gardens. Marina Metro Hotel is a well located place to stay as it's on the coast, only a 10 minute walk from St Helier town centre and it's on the main bus route. The Premier rooms have panoramic sea views. Awarded Trip Advisor 'Certificate of Excellence for the year of 2012'. Biarritz Hotel has panoramic views of St Brelade's Bay & gardens which lead down to the beach. St Helier town centre 10 minute drive. Free on-site parking. Outdoor children's play area. Games room. Rooms with sea views. Ground floor rooms available. Lift. Restaurant home cooked dishes, delicious desserts, daily vegetarian option. Carvery on Saturdays and Wednesdays. The Royal Yacht Hotel is a modern, luxury spa hotel situated in St Helier town centre. Waterfront restaurants (Sirocco, Café Zephyr, The Grill and The Drift), popular bars with live entertainment (The P.O.S.H Bar, The Cabin and The Lazyjack), luxury spa ('Spa Sirène'), gym and indoor swimming pool. Views across the marina, charming Jersey museum courtyard and Elizabeth Castle. No parking but there is a public car park 2 minutes walk away. Samare's Coast Hotel and 12 self-catering apartments are located on the south coast of Jersey in a prime sea front location with sea views over sandy St. Clement's Bay. The hotel has an indoor leisure complex with swimming pool, spa bath, steam room and modern mini gym plus an outdoor swimming pool and award winning gardens. Carpark. Near Bus stop. Buses to St Helier take 15 min. and 25 min. to Gorey Harbour. Only 30 min. The Apollo Hotel in Jersey is graded 3 star by the AA and situated in the heart of St. Helier. Built around its own quiet garden courtyard with a superb 45' outdoor swimming pool, with a separate swimming pool for the 35' (11m) water chute, as well as having its own indoor swimming pool and free car parking means that this hotel has some of best facilities in Jersey. 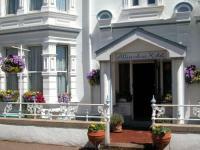 Ommaroo Hotel is a 3 star Victorian hotel located on the southern outskirts of St Helier. Situated on the Havre Des Pas promenade, Ommaroo Hotel is just a ten minute walk from St Helier's town centre. The Victorian style has been carefully preserved offering an elegant yet comfortable atmosphere, with 82 bedrooms in total, many with sea views and balconies. Revere Hotel in Jersey is a charming 3 star boutique hotel in St Helier with an old world ambience and character. There are 56 lavishly decorated bedrooms with modern bathrooms and flat screen TVs and 8 rooms have 4-poster beds. There are 2 locally renowned restaurants with cuisine from classical French/English to New World Fusion. The Metropole Hotel is located in St Helier town centre, just a 5 minute walk (500 metres) from the main beach and Howard Davis Park. It is a popular, family friendly hotel with inside and outdoor heated swimming pools, Jacuzzi, steam room, small gym, coffee shop, restaurant and bar. Family rooms available. The Alhambra Hotel near St Helier in Jersey is a 18 bedroom family run hotel set in a lovely Victorian building. Conveniently located just one minute's walk from Havre des Pas Beach and outdoor swimming pool/ lido and it's an easy 10 minute walk into St Helier town centre. All our bedrooms have en-suite shower rooms, telephones, TV, tea and coffee making facilities, hair dryers and free Wi-Fi.